Multi+ can be applied to smooth leather, suede, patent and textiles. 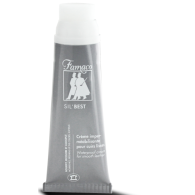 It protects, conditions and restores colour. Remove dust or dirt with a Famaco brush, hold can 25 cm away and spray in short bursts, avoid overspraying, leave to dry for 10 minutes, then brush the material.